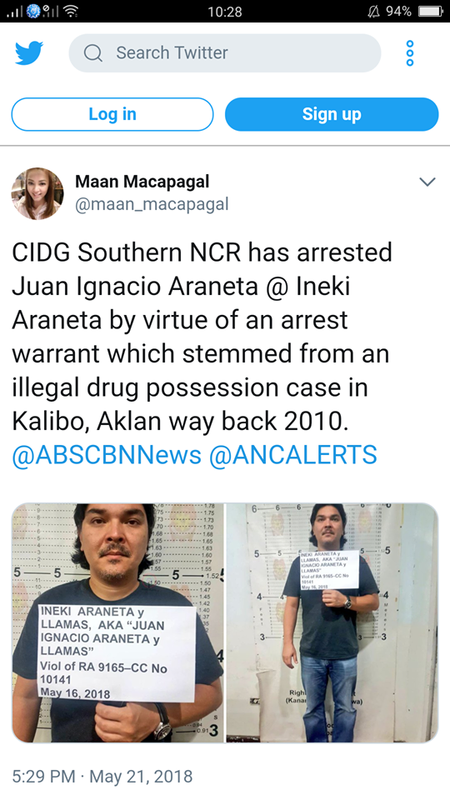 CIDG Southern NCR has arrested Juan Ignacio Araneta @ Ineki Araneta by virtue of an arrest warrant which stemmed from an illegal drug possession case in Kalibo, Aklan way back 2010. Law enforcers arrested a businessman fugitive in Kamagong Street, San Antonio Village, Makati for alleged illegal drug trafficking in Boracay several years ago. 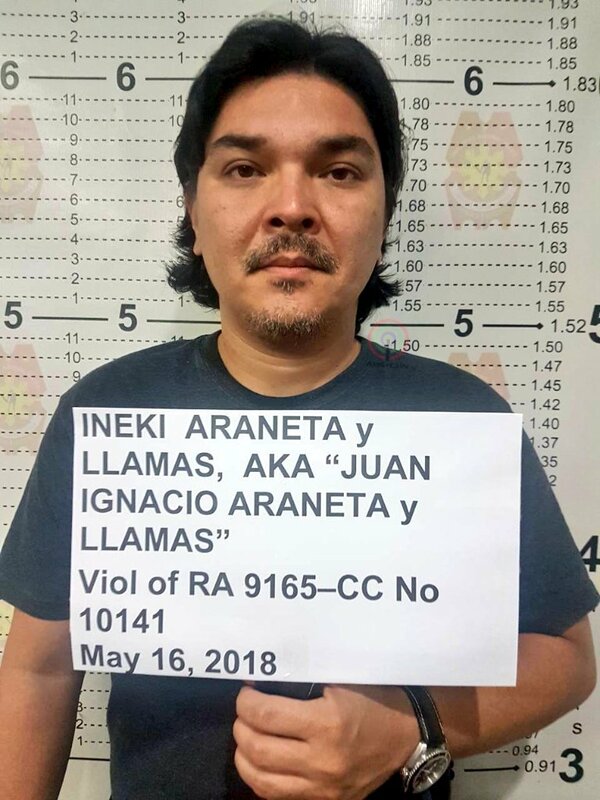 Suspect Juan Ignacio Araneta alias Inaki Araneta hid from authorities for 7 years after he was allegedly caught with a vial of cocaine in Boracay. “Nahuli siya in possession of a vial, allegedly vial ng cocaine saka yung latagan, salangan in his possession while using cocaine,” Senior Supt. Eleazar Matta, head of the Criminal Investigation and Detection Group Southern National Capital Region, said. Matta said Araneta was arrested and due for inquest proceedings when he was caught in 2011. “When he was arrested, dinala siya sa prosecutor’s office for inquest proceeding but during that time, parang nakatakas yata siya, pina-take charge niya sa lawyer niya. At naging parang helpless ang mga pulis natin dito. Allegedly, during that time, may mga tumatawag daw, nag-mention,” Matta explained. CIDG said they will investigate why the police handling Araneta’s case allowed the suspect to go free. “Inaalam ang koneksiyon nito sa politics sa Aklan, doon sa mga police officer na nag-intervene doon sa inquest proceeding…during the inquest parang ganon ang nangyari kaya iimbestigahan natin ang mga pulis na nag-inquest sa kanya during that time at hindi pa siya free from that liability,” Matta said. Matta said Araneta is still charged with violation of section 11 of Republic Act 9165. “According dun sa presented birth certificate, ang propesyon ng tatay niya, businessman owning LBC or 2GO... 'Yan pa po ang inaalam namin as of this time, at kung may relation naman siya kay former Secretary Mar Roxas, malalaman din po namin,” Matta said. Meanwhile, the former Department of the Interior and Local Government (DILG) secretary denied knowing and meeting the suspect who was being linked to him as an alleged kin. “Di ko siya kilala. And I don’t recall ever meeting such a person. Baka from ibang branch ng Araneta yan. Sa mga nagkakalat ng fake news – mali kayo,” Roxas told media. 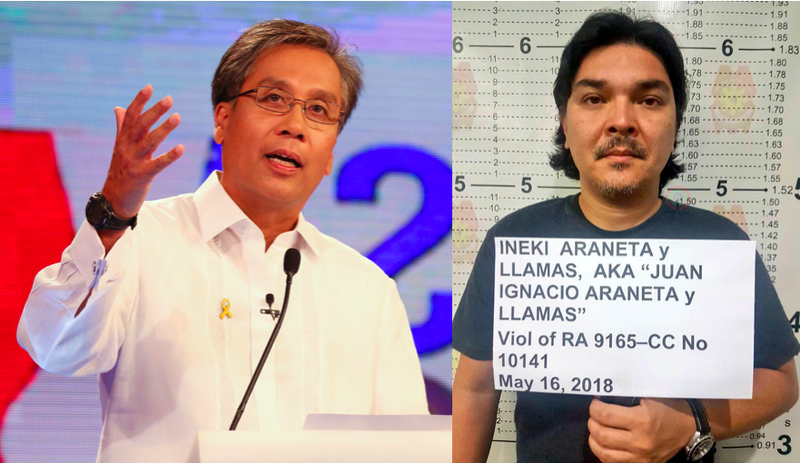 CIDG-NCR insisted Araneta’s arrest has nothing to do with politics. “Regardless kung anong political affiliation, color or what at may information na may into hiding sa amin dito sa Metro Manila at may valid warrant of arrest, inaaksiyunan namin yan at inaaresto at nirerespondehan,” Matta said. Araneta is currently out on bail after paying P200,000 bond money.